Dance Back in Time to the Tune of Hits of the 60's! 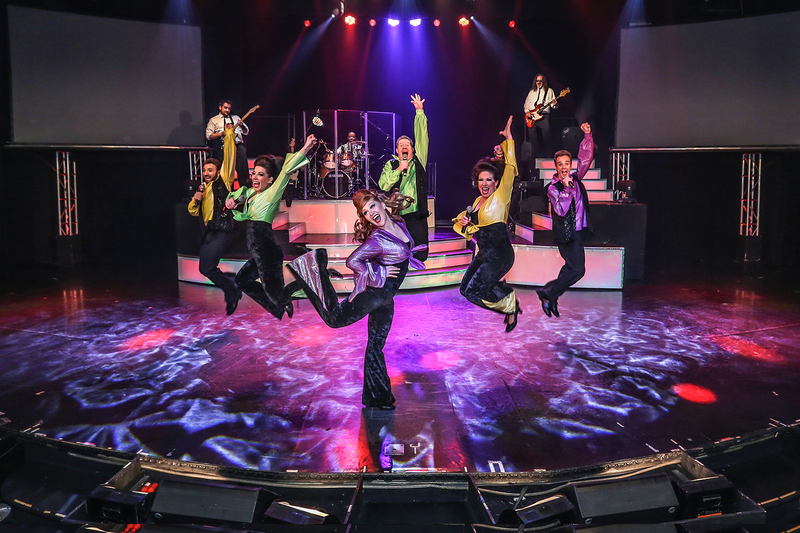 The #1 Hits of the 60’s is one of the most popular Branson shows that offers ultimate fun with energetic artists performing favorite hits of the 60’s. This fantastic Branson show will take you back in time as the artists revisit and reminisce the era of the British Invasion of Liverpool Legends, the SIX performance of the songs of the Beach Boys, The Haygoods of five brothers and one sister, and the world famous Platters. Some of the classic songs that you will hear in this show are popular 1960’s hits such as Hey Jude, Do Ya Love Me, Ain’t Mountain High, Cherish, and A Hard Day’s Night, and much more. But the one that really distinguishes #Hits of the 60’s from any other show is that every performer is passionate about the fact that the unforgettable music and its connection to the audience is what makes the show fantastic. In this show you won’t want to miss the Liverpool Legends that relive the unforgettable era of Beatlemania. This famous rock band is the only Beatles tribute band whose members were personally selected by Louis, George Harrison’s sister. The Grammy-nominated foursome performs the songs of the Beatles of their entire career. The band employs very similar musical detail including the use of vintage instruments, authentic costume changes, and state-of-the-art special effects. They perfectly recreate the sound, look, and mannerisms of John, Paul, George, and Ringo very realistically. It’s like you’ve travelled back in time. You will also get to see the “SIX” that is sure to captivate the hearts of the audience as they perform the rhythmic percussion and booming bass that come from musical instruments. You will never know what to hear next from their playlist, it could be Elvis, The Beach Boys, or Tom Jones or any variety of favorite 60’s artists. Composed of 5 brothers and 1 sister, the Haygoods performs with incredibly tight harmonies, energetic and amazing performances on over 20 different musical instruments. Another interesting performance not to be missed in this Branson Show is the World Famous Platters Revue. Relive the sentimental songs as their satin voices entertain you with the sounds of Motown’s Glory Days. This singing group offers unique songs created by the Platters with such classics as “Smoke Gets in Your Eyes”, “Only You”, “Twilight Time”, and “My Prayer”. The show that will let you remember the drive-in movies, slow dancing and your first kiss. So, if you want to see fantastic performances with the energetic artists, don’t miss to watch this #1 Hits of the 60’s Branson show.